View More In Furniture Pads. ❤LIMITED PROMOTION❤ ADD $3.99 TO GET "20 Pieces 2" Non Slip Furniture Pads" TOGETHER WITH THIS ITEM. Please search B07GZCX8Q6 or B07GZ8HZDK. How much time, effort and money will it cost to have all the scratches removed? With our premium furniture pads in place your hardwood, laminate and tile floors will be protected from scratches and scuffs from furniture. Even slightly rearranging furniture on hardwood floors can cause severe damage, which would cost a fortune to have sanded and refinished. Protect your wooden, laminate or tile floors with our top-quality premium furniture pads. 1. Make sure the furniture leg surface where the furniture pad will be is clean, dry and smooth. 2. Cut the furniture pad to size if needed, remove the paper and press in place for 10 seconds. 3. After pressing the furniture pad in place let it stand for the next 24 hours without moving. 4. Do not use this furniture pad as a furniture mover or slider. 5. Keep away from infants, children and pets. 2 - 4x6 inch rectangle furniture pads for heavy furniture. You can scissor out the right shape and size. 30 - 0.4 inch Rubber Bumper pads for plant pots, vases, doors, drawers and kitchen cabinets. 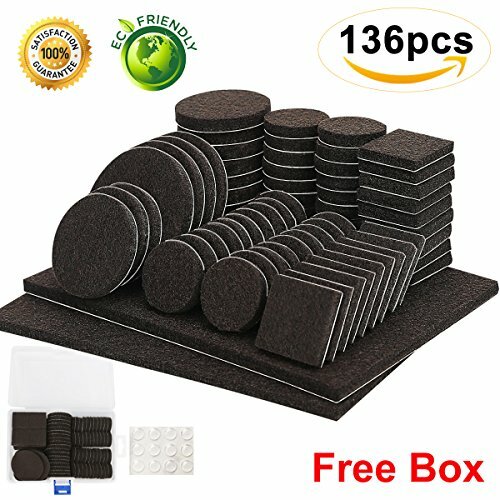 ❤LARGE VARIETY PACK❤ Our 136PCS Pack with Storage Case contains furniture pads of the 6 most useful sizes, round & square and in dark brown: (52) 1", (20) 1.5", (4) 2", (28) 1"x1" and (2) 4"x6". Plus you get (30) 0.4"clear rubber bumper pads. These should be more than enough coaster pads to protect all your floors from being damaged by ugly scratches. ❤STRONG ADHESIVE BACKING❤ Premium heavy-duty soft furniture leg pads 0.2inch thick with a very sticky self-adhesive backing to ensure the pads stay in place. Our top-quality felt pads are made of the most advanced materials, designed for many years of use. To protect the value and beauty of your floors from unsightly scratches and scuffs, our premium quality furniture leg pads are a must! ❤QUICK & EASY SOLUTION❤ All you do is clean, peel, and stick the furniture pads. Furniture and floor surfaces should be cleaned of any dirt, debris or sand to ensure a strong bond. You can customize the size by cutting the furniture pads into any shape that fits your furniture. Extra furniture pads can be easily kept in the handy storage case. ❤100% GUARANTEE❤ All customers receive a lifetime 100% satisfaction guarantee, making this furniture pad a risk-free purchase. We take pride in providing the highest quality and most durable felt furniture pads on the market are happy to guarantee our product. If you have any problem at all, please contact us so that we can resolve your problem. If you have any questions about this product by FurniMate, contact us by completing and submitting the form below. If you are looking for a specif part number, please include it with your message.